An embittered and disillusioned policeman takes revenge on society in this unputdownable serial killer thriller. Retired from the force, Detective Superintendent Jeffrey Brandt goes native. He stabs a woman but holds back from killing her. Frustrated that no one takes any notice, he ups his game. Next time, he’ll kill. Brandt fully knows how the police work. He’ll use this knowledge to win a sick game; after all, he’s chosen the rules. The crime scenes are spotless, Brandt’s covered his tracks. There is no forensic evidence. Yet each killing has his unmistakeable print. Faced with the challenge of discovering his identity is DCI Stella Johnson. Quick-witted and uncompromising, she rises to Brandt’s macabre challenge. But if she finds the killer, what will she do given that he is always one step ahead? Who will win this mortal battle of wits between hunter and hunted? 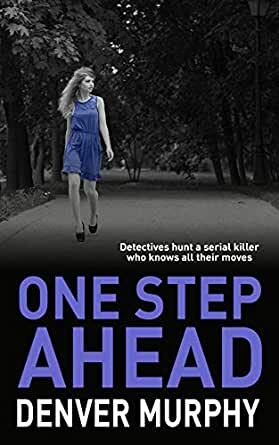 ONE STEP AHEAD is the first book in a trilogy featuring DSI Brandt and DCI Johnson. It is set in Nottingham and further afield in England. Like HIDE AND SEEK, book 2, it is FREE with Kindle Unlimited and available in paperback. SMOKE AND MIRRORS, book 3, is also now available on Kindle and coming soon in paperback. If you like thrillers with meat on the bones, get stuck in to this binge-worthy series now! THE HUSBANDS: how far would you go to find out who killed your wife? 5.0 out of 5 starsCaptivating Trilogy! This is the first of three novels that sees two strong characters pitted against each other in a cat and mouse chase, often with the roles reversed. Rather than dwell on the police procedural minutiae of the hunt for a serial killer, much emphasis is placed on the thought processes of and insights gained by the main players, equal in rank and intelligence, as they do whatever it takes to achieve their aim. A thoroughly enjoyable and intriguing read (all three books). This book was a do not put down until the end. Two detective s try to catch a serial killer. Their relationship was growing into something personal but it never got there. I was so disappointed in McNeil death. I did not see that coming. DSI Johnson will go to any lengths to catch him now. This trilogy is well worth the read. Can wait to start book two. Well done. Was so disappointed in this book. Stuck with it until the end. Failed to impress. Too much fill involving the murderer. Will say it was different but I prefer mystery in books of this genre. This story was exceptionally thrilling from the first page to the final page!!!! The characters were interesting and the story line very entertaining. I cannot wait to read the next book in this series. A MUST read for those that enjoy suspense !! Interesting plot but too detailed. I found myself skipping parts. I also hate books that require you to buy the series to know what happens. I absolutely could not put this book down and literally stayed up all night reading it. A serial killer that takes things to a whole new level. A book of cat and mouse but it leaves you wondering who it the cat and who is the mouse. ABSOLUTELY BRILLIANT!